No Matter Who We’re With is a delightful picture book that captures the difficulty of having to spend time with mum and dad on different occasions due to separation. As a divorced father Robert Vescio has done a wonderful job of addressing the topic from the child’s point of view, using his own experiences to capture the moment. His own emotion and compassion shines through in his writing. This is a book that turns what can be a difficult topic to discuss with kids into fun and an opportunity of sharing. After reading No Matter Who We’re With I felt as though I wanted to shout Yes! at the top of my voice. Where was this book when I divorced and my children needed that little bit of reassurance. When I was reading it to my daughter, now 6 years old, I could see her face lighting up as she realised she was not alone, other children went through this too. It was a moment of enlightenment and that of building self worth and self esteem as she felt a bit of normality and relief. No Matter Who We’re With makes splitting your time between two parents something that is ok. It acknowledges that it is ok to miss one parent when you are with the other. You can love both parents even though they do not live together anymore. It is ok to feel sad each time you leave a parent to be with the other but you can still have fun. It is important to note the acceptance within this book of the situation by the mother and the father. There is a clear message to parents here. It is not about competing or showing dislike for each other but about acceptance of the situation and allowing the children to feel comfortable no matter who’s house they are at. It is all about being an adult and sharing the love of your children regardless of your differences. Unfortunately for some children the relationship between the parents only makes it harder. I love the way this book shows the difference between both parents and, although it tends to stick to stereotypical jobs most of the time, both parents do step outside the general role on occasions, showing versatility. It also has the children acknowledge that they miss the role dad played in their life with mum as they mention ‘Dad used to be really good with a duster-wand’ when dusting with mum. I love the fun the kids have individually with mum and dad but also the reality that chores must be done and food must be cooked. Robert Vescio has touched on a topic that is too often forgotten and he has done it with ease. The illustration by Cheri Sholten show the love and caring between the parents and their children. They enhance the fun loving nature of this book, helping share the pleasures and spontaneity of childhood and family, no matter how it has to be. 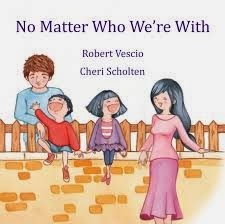 Whether you and your children are just going through divorce and separation or you went there some time ago I urge you to grab a copy of No Matter Who We’re With by Robert Vescio. This book should be a mandatory read for all children who experience the sharing of two homes with their parents.